I’m a lawyer who started work at Copyright Agency 13 years ago focusing on copyright policy and advocating for laws and conditions that will support Australia’s authors and publishers – especially in the digital marketplace. 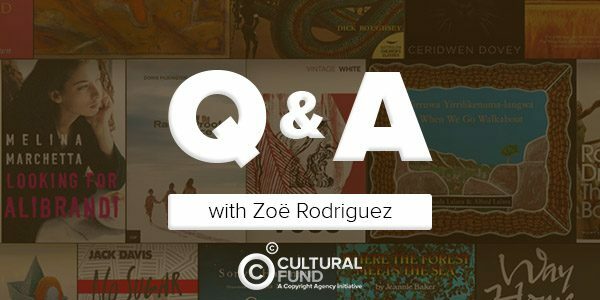 In 2009 I was appointed the Manager of the Copyright Agency’s Cultural Fund which allocates around $2 million per year to projects that will benefit Australia’s publishing and visual arts industries. Before embarking an a legal career I was a high school English teacher in Australia and South Korea. What has been your involvement with Reading Australia? I’ve been involved since day one: at a meeting with Brian Johns (then Chair of the Cultural Fund Committee) at the National Library where the National Librarian and her senior staff introduced to us Trove, the brand new online archive of digitised materials. At the same time leading publishers and literary critics were publicly lamenting the scarcity of Australian books being taught in schools and universities. Brian Johns put these two things together and said, ‘We can see what amazing items you have here. I have a suggestion: How about we come up with a list of great Australian works and put them together with your digitised resources to help help make these works more dynamic for teachers and students.’ That was the start. We asked the ASA Council – 12 significant Australian writers working in diverse genres – to come to a two-day roundtable where 200 titles would be selected. Their only instruction was that they needed to select texts that told the story of Australia – covering significant areas of our history and culture. It was a fantastically lively and informed discussion. I wish we’d recorded it! Of course the debate got heated at points with each participant advocating strongly for the works they thought should be included. I always hoped the list would generate controversy, but almost unanimously people said this wonderful group had done an extraordinary job that was a difficult one – they’d chosen a solid list, but also included lively, dynamic and fresh works. We consulted leading educators at school and tertiary level. They suggested we create formal teaching resources for individual titles on the list that would be mapped to the yet-to-be implemented National Curriculum. They even came up with our name, Reading Australia. Since then we’ve created many more resources and we’ve entered into partnerships with very valuable partners, including teacher associations, journals, publishers and the ABC through its dedicated online educational platform, Splash. Reading Australia was born at a very convenient time – many of our publisher members had already decided to digitise their backlists which contained just about all of the works on the RA list that had fallen out of print. When we told them our plans and they realised how serious we were about seeing Australian stories celebrated, many prioritised RA titles up their digitisation schedules – so works and their availability for purchase was in the majority not an issue we had to address. For me it has been a great joy to see RA grow from Brian’s great idea to a reality that supports both our teachers and our local story tellers, and is something I take great pride in telling friends in Australia and overseas about. Especially for foreign friends it is a great introduction to some of our best stories and story-tellers. Why is Reading Australia important? It is critical that Australians read Australian stories – this is our culture, our country, and reading our great fiction and non-fiction tells us about our past, about our present and can help us to look intelligently to our future. It’s remarkable how many themes in works from 100 years ago are still relevant today. It’s also important as a one-stop-shop to celebrate our very rich literary heritage – not just for teachers and students but for any reader. Having formal links to the school sector means that children from very early on in their education are being exposed to Australian great stories alongside those from around the world. Having been a teacher and having spoken to so many teachers, I know that having quality resources will help our teachers to share these stories with their classrooms – encouraging them to try new books and maybe to look at ones they know well in new ways. How do you see the future of Australian literature/literacy? I think Australian literature’s future is vibrant. Digital publishing has not killed off local story tellers; it’s provided new avenues for books to find readers. Children’s books beyond all remain a very valuable part of the print book industry – there’s nothing like holding a beautiful illustrated book in your hands and reading it with a child or watching them enter these imaginary worlds. Literacy’s future in Australia is central to our success as a country – being literate is at the core of being able to participate fully in the community. Knowing Australia through literature can only be a good thing for Australians young and old. What’s your favourite book on the list? I might show family bias and say Judith Rodriguez’ The Hanging of Minnie Thwaites, which is a fabulous and unique book. And if I can’t say that, my favourite book on the list is Christina Stead’s The Man Who Loved Children. Those characters stay with you, they are so well depicted. For me it evokes Sydney and Watson’s Bay in such a visceral way – though of course she refers to the Shanandoah in an attempt to avoid defamation by relocating the novel to the US.